We are a PC Environment ONLY! We also accepted the following file formats below. Any linked photos or artwork must accompany the Illustrator file onto the disk. Please make sure that it, too, is CMYK if the ad is color. If from Photoshop, please see next section. *Note: All Illustrator files will be "read only": that means we will not be able to make any changes to your file. We only accept PSD, TIF, JPEG or EPS file formats. Any linked photos, artwork and fonts (Screen & Printer Fonts) for document must also accompany the InDesign file onto the disk. Black & White Ads Only - All artwork must be grayscale and fonts must be embedded. Color Ads - All artwork must be CMYK format and fonts must be embedded. Please specify which publication the ad is to appear in and the run date. Please note that any attachments sent by email must contain the advertiser's name. DEADLINE: The deadline for display advertising is 5 p.m. the Monday preceding the date of publication. Proofs are available on ad copy received by the Friday immediately preceding the Wednesday publication date. MECHANICAL REQUIREMENTS: The SandPaper is newspaper tabloid in size. It has four 14 pica advertising columns per page. Pages are 59 picas wide and 13 inches high. There is a one-pica gutter between columns. Ads are sold by the column inch. The minimum ad size is two column inches. Ads with depth exceeding 11 inches will be charged for 13 inches. There are no extra charges for normal ad production, including typesetting and graphics. Retail advertising rates are net. 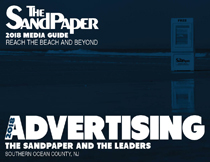 SAU SIZES: Jersey Shore Newsmagazines accepts the industry SAU sizes up to five columns wide and 13 inches deep. Small size changes may be advisable to adjust some SAU sizes for The SandPaper column widths. Consult a sales representative for help determining which SAUs work best. 4 Column - Approx. 9.8"
3 Column - Approx. 7.3"
2 Column - Approx. 4.8"
1/4 pg. = 2 col. (4.8") x 6.3" or 3 col. (7.3") x 4.3"
1/3 pg. = 2 col. (4.8") x 8.8"
1/2 pg. = 2 col. (4.8") x 13" or 3 col. (7.3") x 8.3"
or 4 col. (9.8") x 6.3"
3/4 pg. = 3 col. (7.3") x 13"
Full pg. = 4 col. (9.8") x 13"
We take a pica off depth measurements to insure spacing between individual ads. 6 Picas equal 1". Exception: On a full depth ad of 13", you do not take a pica off.